If you're looking for an inexpensive, natural boost to your beauty regimen, look no further than humble Epsom salt. 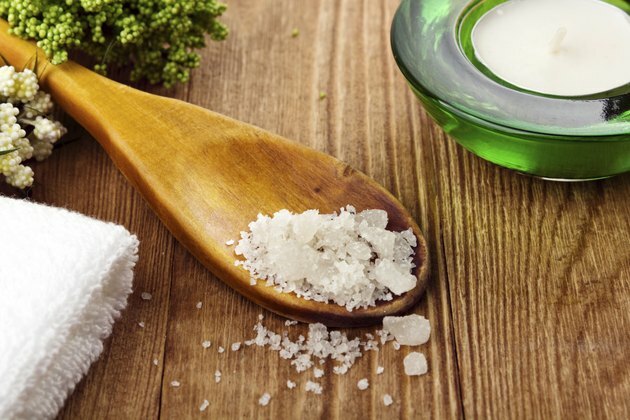 Epsom salt is actually a crystalized form of the pure-mineral compound magnesium sulfate. It is readily available at most drug stores and is widely used in bath products to help increase circulation, which can be helpful for a healthy scalp as well as soothing sore muscles. Use Epsom salt in conjunction with other hair products to treat oily hair or to revitalize dry hair. Measure out 2 tablespoons of Epsom salt and add it to a bottle of shampoo. Shake the bottle to mix and dissolve the salt. Wet your hair thoroughly. Add a quarter-size dose of your Epsom salt-infused shampoo to your palms and rub them together to start lathering the mixture. Massage the shampoo into your hair. Focus on massaging the mixture into your hair's roots and your scalp to treat the oiliest areas. Rinse well and repeat the process. The first shampooing removes a lot of the dead skin cells and oil from your scalp. Shampooing the second time lets the magnesium sulfate in the Epsom salt to penetrate your scalp, leaving it cleaner and fresher than if you only washed it once. Wash your hair with Epsom salt and shampoo every other time that you shampoo to avoid over-drying your hair and scalp. Mix equal amounts of Epsom salt and your favorite conditioner in a small bowl. For example, if you use 3 tablespoons of conditioner, add 3 tablespoons of salt. Stir the mixture and place it in your microwave. Heat it for 30 seconds, stir it again and carefully touch it. It should be warm, but cool enough to touch without burning your skin. Heat it longer or let it cool, if necessary. Shampoo your hair as usual before massaging the warm conditioner into your hair, coating it from your roots and scalp to the ends. Let the conditioning mix sit for approximately 20 minutes. Rinse your hair thoroughly with warm water and style it as usual. Make a buildup-busting hair rinse by combining 1 cup of Epsom salt and 1 cup of lemon juice for every 1 gallon of water. Let the mixture sit for at least 24 hours. Use it whenever your hair is feeling greasy. Add three to five drops of patchouli oil to your Epsom-salt-and-shampoo mixture. According to Sandi Brenner, author of the book "Beauty and the Budget," the oil helps minimize your scalp's oil production.